I felt a bit sad when I saw the closed sign. I guess I have to go to the Marina Square branch for my super spicy Ramen fix, but I much prefer this location. This was the only place that had fish based soup for their Ramen. I guess the competition was too great with so many top notch Ramen restaurants located at this mall. Restaurants and cafes in Singapore seem to be here today and gone the next. It’s really tough, with the heat of sky rocketing rentals, a small market and just so many choices. 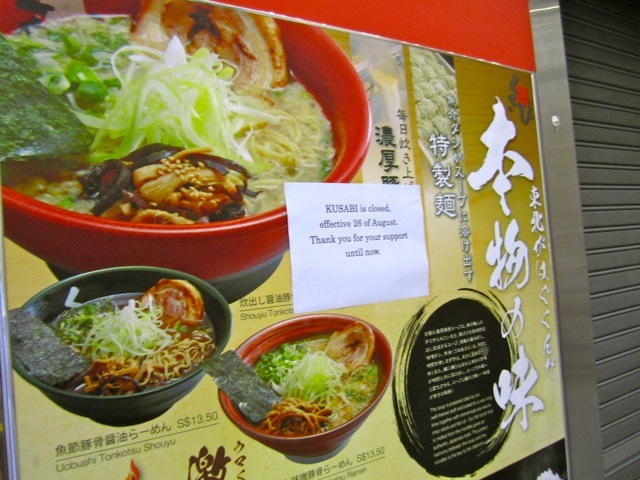 This entry was posted in Food in Singapore and tagged closed, Kusabi, Life, Living, mall, news, outlet, photography, photos, Ramen, rentals, Singapore, The Central. Bookmark the permalink.